The Department of Medicine accepts into the preliminary year program the candidate desiring a strong clinical year of internal medicine before pursuing training at the second-year level in dermatology, anesthesiology, ophthalmology and other specialties. The rotations and responsibilities for the intern accepted into the preliminary program are similar to those of the intern in the categorical program with the addition of a month of Emergency Medicine and no continuity clinic. Compared to the categorical first year, the preliminary year includes one rotation in the Northwestern Memorial Hospital Emergency Room and one month of inpatient oncology (instead of two). 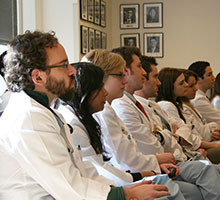 Successful completion of this year qualifies the trainee for one year toward board certification in internal medicine. Graduates of this track universally enjoy it; please contact Kim Dow if you’d like to get more information. "I wanted a program that would challenge me to think independently and encourage me to use my own problem solving skills to dissect clinical problems. Northwestern has exceeded my expectations and I've made close friends here that I know I will be in touch with when I become the guy behind the blue curtain."